First, a word about Esxence for those of you who’d been expecting my impressions… To be frank, I clearly overestimated my gift of ubiquity and underestimated both the sheer number of brands to discover and the amount of time I’d have to give over to promoting The Perfume Lover. I did pick up a few samples, for instance at Ys Uzac and Maria Candida Gentile, which I will review in due course… Next time I attend a trade fair, I’ll make sure I schedule a proper meet-up with all the lovely people I barely had a glimpse of! There are practically no lilac soliflores in fine fragrance, namely because the smell is so ubiquitous in functional products (the disinfectant properties of alpha-terpineol, a pine oil derivative with an intense lilac-like odour, have led to its widespread use in soaps and detergents). So that fans of the unloved blossom have had little to fall back on apart from Olivia Giacobetti’s whimsical En Passant for Frédéric Malle – more of a fleeting impression of a lilac tree in a hidden Parisian garden, with a strong aquatic cucumber note. But there’s been a tiny uptick lately, both in the mainstream with Idylle Duet Jasmin Lilas, and in niche with Phaedon Rue des Lilas. I didn’t get much of a sniff of the Guerlain; the Phaedon, a “white lilac” according to the brand, is an aldehydic rendition with strong almondy tones. And then, of course, there was Yves Rocher’s Pur Désir de Lilas by Annick Menardo, an excellent portrait of the flower. It’s just been replaced with Purple Lilac, available in eau de toilette, body lotion and shower gel. The new version improves on Pur Désir de Lilas with more naturalistic effects due to the addition of fresh green top notes and more distinctly rosy heart – less soapy than its predecessor – on a powdery vanilla base. Menardo has done away with the slightly tinnish, synthetic effects of the Pur Désir version, though the spiciness and honeyed animalic notes of certain lilac blossoms is not showcased – the scent, featured in a “Morning in the garden” trio along with Rose Fraîche and Agrumes en fleurs, leans towards spring-time freshness. Now, on to you: is there any little-loved flower you’d dream of seeing featured in a perfume? I don't know if anyone in central europe or america knows Mirabilis Jalapa, also known as night-flower. It has nothing to do with night queen, evening primrose, jasmins or other flowers that bloom at night, not in genus nor in fragrance. The blossoms can be bright, almost fluorescent purple or yellow, more rarely white and quite often a combination of the above. It produces seeds like pepper corns. The scent is very strange, understated and yet intoxicating. It is very diffusive, creating a scented mist one might say and yet, if you stick your nose in a blossom you will get almost no scent at all. The scent itself is watery-floral, not the least indolic, with a very fresh green bitterness to it like crushed stems and a peppery nuance. I believe it to be also slightly musky, like ambrette or angelika. The scent might be too quirky for a soliflor (although for me, a lover of quirky perfumes it would be just fine) but can support and transform other night flowers or woody scents and in my opinion would be a perfect pair for incense. It carries the moisture of the night, the breath of damp earth and it would turn any composition in nocturnal fugue. Kostas, your description of the scent of the night-flower reminds me of how poorly flower fragrances are described on botanical websites. The best I could find was that the smell was reminiscent of tobacco flowers and jasmine. Maybe perfume companies have done headspace captures but they're not saying! It sounds wonderful. Ines, while you're there, do poke your nose into the Oriental shower oil, it's totally addictive! Around this time of year, I start craving lilac, but it's hard to find a lilac that doesn't smell like industrial strength air freshener. I recently bought myself a bottle of En Passant, but I obviously should get some of the Yves Rocher as well. Jarvis, the Yves Rocher is lovely, though very clean and tending to veer more towards lily-of-the-valley towards the drydown. You should have a sniff of the Phaedon as well, though as I write I find it really pretty almondy, but it's got a little more heft. Glad you liked it. Do you happen to know of any other scents that have great diffusion but can't be smelled from up close? Kostas, I find that often occurs in tree blossoms: they either smell different, or much less than from afar, when you put your nose into them. Recently: Japanese cherry blossom. From memory: linden blossom. Completely different according to where you are. We have chinaberry trees in these parts - they're native to central Asia, I think, but they're an invasive species here. Some people call them cape lilacs, though they aren't lilacs - my guess is that they got the name because of the smell, which is similar to lilacs but a little fruitier. They have massive "sillage," you can smell them from a block away. Also, the mimosas we have in the southern US - not the yellow ones, but the trees with the fluffy pink Dr. Seussian blooms - they also smell soooooo divine. Central Texas smells pretty divine at this time of year, what with all this and the jasmine and the wisteria... walking through my neighborhood is a treat. I love lilac - is the Yves Rocher Purple Lilac brand new, and will it be available online (to us in the USA?). Lily of the valley has lost a lot of love, for the same reason as lilac: its over-use in functional products. Yet it is the main note in one of the most sublime fragrances ever, Diorissimo! In my search for the perfect LOV scent (aside from the Dior), I've understood how difficult it is to create a really good one. Still looking! Patty, Purple Lilac went on sale here on April 1st, and I've seen it on the French website, but I don't know whether products are made available at the same time abroad. I love four-o'-clocks (Mirabilis jalapa). My mother grew several color varieties of this flowering shrub, all of which were fragrant-- but none so much as one particular cream-colored shrub whose blossoms smelled of lemon creme and saffron. If ever a perfumer chose this flower as a theme, I would melt with gratitude. Marla, here wisteria is very phenolic/cresolic with green and honeyed aspects, though there is that "Concord grape" note too. Yves Rocher scents are certainly popular here in France since I've been told Comme une Evidence (by Menardo) is actually the N°1 best-selling perfume in France, which doesn't come up in stats because it's not sold on selective perfumery circuits. The terroir is so important, isn't it? In Texas, wisteria is just pure grape soda, in the best possible sense. I didn't know CuE was by A. Menardo. It's quite nice! There are some lovely suggestions in these comments. I'd love to smell Privet blooms recreated accurately in perfume because the scent is so evocative. Failing that, Narcissus or a Daphne, or a good Witch-hazel or a true Broom. Anna, I had to look up privet, because in France it's got an entirely different name, "troène"... being in the same family as jasmine (and olive trees) they've got a related scent. Daphne poses an interesting problem in perfumery, since it is a combination of hyacinth, jasmine and carnation: would a fragrance inspired by it smell like daphne or just a floral bouquet? Alyssa, I've experienced that: sometimes a lovely smell will creep up on me with no discernible source and if I'm not in a hurry, I go hunting for it. So I'm the mad lady sniffing at shrubs in parks. Like others here, I crave 'le temps de lilas' at this time of year, and so I had to go straight to the homepage and buy it. What can go wrong? As you say if it doesn't work on skin, it'll probably make a lovely roomspray:-) (oh and it was 40% reduced). Unfortunately I get very little almond in Phaedons lilac scent and too much lotv, but Soivohle's 'lilac and heliotrope' works well and of course Guerlinade works a treat. Asali, as I said to someone above, the Yves Rocher does tend to veer into muguet towards the end, but with 40% off, as you say, it's pretty much impossible to go wrong! 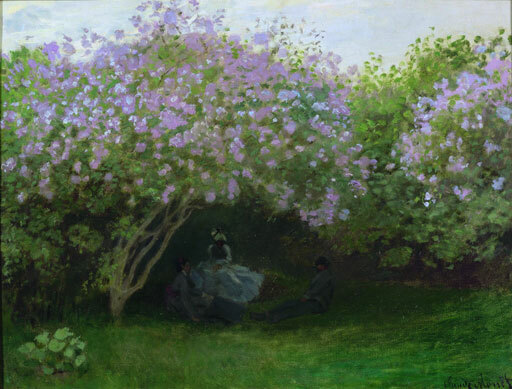 Thanks for having put on top of the page one of my favourite Monet, I've just filled my eyes (and I would say... nostrils) with the beautiful Manet's lilac vase at Alte Nationalgalerie in Berlin. Some people may know Dartington Hall in Devon (home of Dorothy Elmhurst in the 1920s and now an international arts centre)we live nearby and one May a few years ago walking throug the grounds I caught an intoxicating scent on a breeze. In the end i had to ask a gardener who smiled knowingly and showed me what it was - the small pendulous flowers of Eleagnus Umbellatus. A scent of heaven. Iodine, I saw the wisteria in Milan from afar, but never got a chance to catch up with the lilacs. Terribly sorry I was in such a mad rush, I truly had no idea it was going to be that way. Maureen, I'm looking up elaeagnus as I'm typing this. I've found the elaeagnus angustifolia has a honeyed smell. I've also read "orange blossom" as a descriptive. Elaeagnus ebbingei is said to be jasmine/carnation. Another descriptive adds green, almost mossy-mushroomy aspects with a bit of hyacinth thrown in. I'm sure I've seen and smelled the shrub before, but without analysing the scent. Now I'll have to wait until I stumble on one!